In 1970, my husband’s parents arrived in Australia as ’10 pound poms’, with him, as a toddler, in tow. My father-in-law was the driving force, having been desperate to leave his birthplace from when he was quite young; my mother-in-law accompanied him but her heart has always remained in the UK. There is barely a conversation had with her that does not refer to England. I can see how the lure to be ‘home’ is coloured by her nostalgia; I doubt the present day reality of her birthplace and her now mature siblings can match the image that is in her mind. So for me, this story was quite close to home. 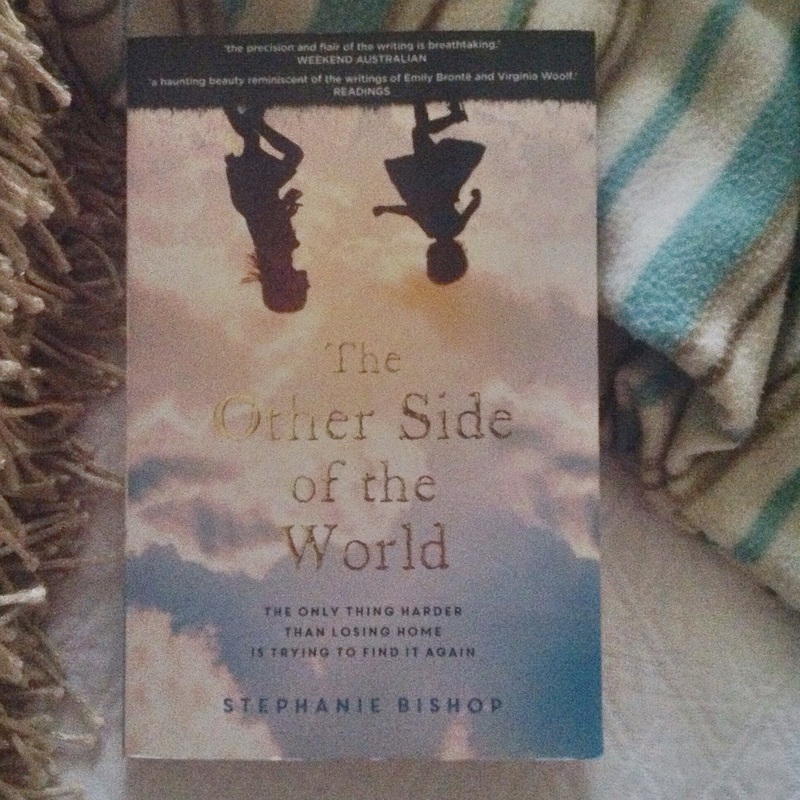 The Other Side of the World by Stephanie Bishop is a beautifully written, heart wrenching novel. It tells the story of Henry and Charlotte Blackwood and their emigration, with their young daughters, from England to Australia in the mid 1960s. Henry, born in India and sent to England by his British and Indian parents on the eve of India’s independence, is eager to move from the damp, grey English climate and his claustrophobic home environment to the warmer weather and wide open spaces of Australia. Charlotte is resistant, but worn down by new motherhood, she eventually relents. Their story explores our sense of belonging, memory and nostalgia and the strains on a marriage faced with such diametrically opposed needs. Bishop’s prose is both evocative and insightful. She creates a strong sense of place. Of their cottage in England, everything is ‘too close’. Charlotte’s daughters, Lucie and May, are beautifully drawn, in descriptions of their conversations and behaviour, and the ‘push and pull’ nature of motherhood sensitively described as Bishop writes of Charlotte needing her children but also feeling ‘smothered’ by them. Have to admit to a few tears stinging my eyes as I read the concluding pages of the book! It can leave us feeling isolated and constantly adrift. How does this affect our sense of who we are and how does this impact upon our relationships? I thoroughly enjoyed this novel both for the themes it explores and its beautiful prose. A highly recommended read, in my opinion! Does this sound like a story that may interest you? Or perhaps you have already read it? Have you lived in different places? < Previous One + Four = Life: routine begone! Next > I’ve never noticed that before! Hi Carolyn, I enjoyed how you incorporated quotes with personal anecdotes in your review. I also like the styled book image. How long does it take you to do this? I need to get creative with my book photographs. Thanks Vicki! I haven’t included quotes before but her writing was just so lovely I wanted to give people a little taste of what they could experience if they choose to read the book. The photo didn’t take too long – perhaps 20 minutes to style and edit (I used the Afterlight app to do this one but sometimes I just use the standard photo function on my phone or iPad).It probably took me about 3 hours to write and edit the post. I did it little bits at a time in between family demands. Writing fleshy book reviews takes time- and that’s before you add quotes. Styling doesn’t come naturally to me, so it’s something that I need to work on. You’re right, Vicki, it does take time! I don’t know that I’m much of a ‘styler’. There’s lots of images online for inspiration. The last few reviews I’ve done I’ve just tried to find something around the house that ties in with the colours on book cover and, if possible links in thematically. With this one I was thinking about placing it on a world map but then I saw the blanket on my bed, it tied in and I thought, well, you read in bed, so I’ll just put that all together! Your books are quite weighty so maybe photographing them in a ‘reading environment’ could be good – on a chair/bed/table with a pair of specs strategically placed? I’ll give that a go. But realistically I don’think I can photograph every book and will have to supplement with stock images, something that I will have to source. I loved this book, too, Carolyn. There was such a wonderful sense of place – both in England and Australia. I found Charlotte quite mysterious – how could she do what she did?!! But her unhappiness was so prevalent throughout the book – she had to do something, I guess! I don’t think I could leave, Karen, but I can understand how hard it can be when your heart wants to be in different places. There is no compromise that can be found. That was the heartbreaking part, wasn’t it, that something had to be sacrificed. I’m sure you’ll enjoy it, Isabel, and you’ll bring to it your own experience of having lived away from home. I think migration is fantastic for some people – my father-in-law is so pleased to be out of where he lived in the UK – but for others it’s not such a great success. And, of course, once you add in having children whose home is not your home, things become quite difficult. There’s not really a compromise sometimes, is there?